A bold display of instrumental power and compositional skill; a perfect groove to open the door to a wonderful Summer Paradise. 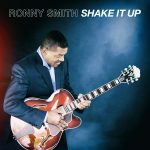 All tracks are original compositions written, produced, arranged and programmed by Ronny Smith who is also featured on guitars, the aptly named “Shake It Up.” This is the perfect groove to open the door to a wonderful summer paradise. 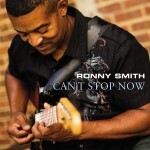 Ronny Smith, a smooth guitar veteran of the Baltimore jazz scene. Ronny considers his early influences to have been George Benson, Wes Montgomery and Joe Pass, and one can hear touches of each of those greats in this CD along with Ronny’s own strong musical personality. The new album “Can’t Stop Now” is Ronny’s sixth release and features the fantastic single “Slim Pickin.” Produced by Eric Copeland for Creative Soul Jazz in association with Next Level Jazz, the album was recorded in Nashville, TN. Playing alongside Ronny were some of the top session musicians of the Nashville scene, including John Hammond, Gary Lunn, Pat Coil, Brian Fullen, Craig Nelson, and Dan Needham.